Having a shed in the backyard is handy, a great place to keep gardening and yard tools out of the rain, but conveniently available for use when you need them. It also frees up space in the garage, which is normally taken up, storing those tools. The shed keeps you from having to haul those tools in and out of the garage, potentially damaging the car. Many people buy a shed kit or even a completely built shed for this, but you can do even better, making your own DIY shed. Using vinyl siding on the shed allows you to match the shed to your home, with a material which will be attractive and provide low maintenance for years. Vinyl siding is extremely easy to work with. You can cut it with any saw, as well as with tin snips. The pieces of siding interlock, making them secure and quick to install. A variety of trim pieces allow you to cover the entire exterior of your shed, including soffits (soffets) and corners, either with the same or a contrasting color. 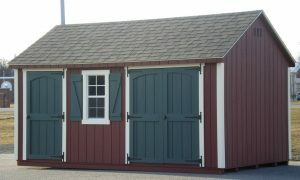 The wide variety of colors available make it easy to match your shed to your home. One precaution about using vinyl siding is that it is subject to heat and extreme sunlight. 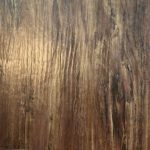 While it will last for a number of years, even in the hottest, sunniest environments, eventually the vinyl will become brittle and the surface can become chalky. Newer vinyl sidings are better at this, but still not perfect. If you already have a shed made of wood in your backyard and are thinking about replacing it, you may want to think again. As long as that shed is structurally sound, you can cover it with vinyl siding, refreshing and renewing it at a fraction of the cost for building a new one. All of the pieces of vinyl should be cut ¼” short of the measured dimension, leaving room for expansion. This means that all places where vinyl pieces meet will need to be caulked, to seal this crack. nails should not be driven all the way down to flush, but rather left 1/32” above the surface of the vinyl, so that the piece can “float” as it expands. 1. To install vinyl siding to an existing wood shed, start by installing the corner trim. Use a carpenter’s level to ensure that they are plumb. 2. Install J-channel around doors and windows, with the cupped side facing out. 3. Attach the starter strip to the bottom of the walls with siding nails. You want to end up with the bottom edge flush with the corner pieces you installed. 4. Measure and cut the siding to fit the walls, leaving the gap mentioned above. Don’t assume that all the pieces for one wall will be the same length, as it is possible that your shed is out of square. 5. Snap each piece of siding into the one below or into the starter strip. This should hold it in place while you nail it. 6. The siding needs to be nailed to the substrate with siding nails. Vinyl siding is usually made with the holes in the edges numbered. This means that once you find a stud, you merely need to look for repetitions of the same number, in order to know where to find the next stud, assuming that your studs are on 16” centers. 7. When you reach the top of the wall, you’ll need to cut a strip of siding horizontally to fit. The part removed should come from the top of the siding strip. Punch holes in the top of this strip and nail it, just like the other strips. If you don’t have a pre-existing shed, you’ll have to build one from scratch. This isn’t actually going to be as hard as it might sound, as you’ll be covering it with vinyl siding. That means that all you’re really going to be doing is building a rough shed, and then covering it with vinyl siding, as I just discussed above. I’m going to work under the assumption that you want to build your shed as inexpensively as possible, while still ending up with a nice-looking shed. So where choices need to be made between materials or construction methods, I’m going to go with the least expensive that will still provide a sturdy, rugged shed. I’d recommend sticking with overall dimensions that are multiples of four. Plywood and other engineered sheet wood products come in 4’ x 8’ sheets. Working in four foot multiples helps give you the maximum possible size, with the minimum possible material waste. It also reduces the number of cuts you have to make. 8’ x 12’ is a nice size for a shed, unless you need something bigger. Pouring a cement slab is expensive, so you’re better off making a platform and setting it on concrete blocks or paving stones. I usually use paving stones for this, so that I can keep the floor of the shed close to ground level. There’s no sense having to push lawnmowers or other tools uphill more than necessary. Measure and place your concrete pavers, taking the time to ensure that they are level. You are much better off digging a paver partially into the ground or shoring it up with gravel, than you are having to shim the structure on top of the paver. You can make the frame for the floor out of 2”x 4” studs, as long as you don’t have a span over six feet long, assuming 16” spacing between joists. If you go longer than six feet, you’ll need to use 2”x 6” dimensional lumber, and if you go over 11 feet, you’ll need to up that to 2”x 8” to meet building code. Of course, if you are not concerned about building code, you can fudge on this a bit. I did, using 2”x 4”s with an eight foot span, and it was still strong enough for my needs. But I wasn’t parking a lawn tractor inside. Cover the framing with ¾” thick CDX plywood. Don’t skimp on this. You might be able to use ½” thick plywood, but the floor will be spongy. I’d also recommend using pressure-treated plywood, even though it is more expensive. You will be dragging in wet grass and mud, which will cause your floor to rot, if you use standard construction plywood. My first garden shed was made with ¾” CDX plywood; but it wasn’t pressure treated. I ended up having to pick the shed up off the floor after five years and replace the floor. Had I known it was only going to last that long, I would have started out with pressure-treated wood. Before building your walls, decide what sort of door you want, because the front wall needs to be built around that door opening. The easiest way is to buy a pre-hung exterior door; but this is also the most expensive option. If you want a less expensive option, you might consider making a barn-door style door and hang it on a track, so that it slides to the side to open. It is easiest to frame your walls on the now-built floor, setting them aside as you finish them. If you buy 2”x 4” studs, rather than 8’ long 2”x 4”s, you’ll end up with the right wall height, once you add a bottom plate and double top plate (standard construction technique). Frame the wall at 16” centers, so that the studs are close enough for your siding. You could go to 24” centers, but you’ll probably need those studs on the inside, for mounting shelves and hanging tools. You will need double studs in the corners, on either the end walls or the front and back walls, but not on both. I’d do it on the end walls, as they will probably be shorter and lighter, but it really doesn’t make any difference. This double stud allows you to nail the two walls together well. For the front wall, make a solid bottom plate, going all the way across, including across the doorway. Once it is installed, the doorway can be cut out with a saw. Doing it this way helps ensure that your wall is installed straight. The doorposts and header for the door frame should be double 2”x 4”s, to add strength for hanging the door. The vinyl siding is not strong enough to attach to the studs, without any substrate. I would recommend ½” MDF, which is less expensive than plywood, as well as coming with a painted surface which will resist moisture well. Attaching the siding to the walls, before putting them in place, will make the walls heavier, but it will also allow you to ensure that they are exactly square. Don’t put the siding onto the walls at his time, to avoid breaking it. Rather, wait until the shed is built, then add the siding afterwards. It’s a good idea to have some help, when it’s time to erect the walls and put on the roof. To erect the walls, start with one end, standing it in place and nailing a 2”x 4” stud at an angle to hold it there, while you nail it to the floor. Don’t worry about getting it plumb, as adding the other walls will do this for you. With one end wall in place, add the back wall next, ensuring that the corner is nailed or screwed together well, with no gaps, and that the top plate is aligned. If you’re going to have any gap, due to walls being of different heights (unlikely, but possible), you’re better off having them at the floor, where it is easy to fill them. With the back wall installed, you can add the third and then finally the fourth wall. Each will ensure that its neighbors are plumb, as long as you’ve built them square and you don’t allow any gaps in the corners. I’d avoid nailing down the second end wall to the floor, until the front wall is also in place and nailed at both ends. If you get the spacing off just a touch, it can be extremely difficult to make that front wall a quarter of an inch shorter, so that it will fit. As with the walls, it’s actually easier to frame the roof, before installing it into place. Rather than building trusses, make the two surfaces of the roof, just as if you were making two wall sections, albeit short walls. Assuming that you are making your shed with some roof overhang and a soffit, you’ll need to notch the 2”x 4”s that make up the rafters. You can figure this angle out easily enough by placing one of the rafters on the gable end and using a scrap of 2”x 4” to mark the notch. Once cut, this piece can become a pattern for the rest. If your roof is going to have any soffits, install them while the roof is on your floor platform, upside down. This is whole lot easier than working overhead to install them. Don’t cover over the roof with MDF, as it will be extremely heavy to lift into place. With both roof pieces built, you’ll need help to lift them in place and hold them while they are being nailed. Be sure to nail them together well at the peak, ensuring that you don’t leave any gaps. The roof can now be skinned over with MDF, covered with felt and shingled. I’ll leave directions on how to do that for another article. If you purchased an prehung door, you can install it now, cutting out the floor plate so that it will fit. If you are using a barn-style door on a track, wait until after you install the siding to put the door on. Since we’re making this a vinyl shed, covering the shed with vinyl siding is done exactly the same way as mentioned for adding it to an already existing shed. You’ll probably want to add trim pieces for the fascia boards, all around, to keep the look consistent and protect the wood from moisture. One last thing I would do is to build a ramp and attach it just below the door, in order to make it easier to take your yard tools in and out. This needs to be made out of pressure-treated wood, as well, to protect it from decomposing. You’ll need to dig out the ground a little bit at the bottom end, so that the ramp can sit flush with the ground. Then fill the dirt back in, so that there is a smooth transition from the ground to the ramp.